SIR GARNET WOLSELEY Autograph LETTER SIGNED. British Field Marshall who served in many campaigns, including the Crimea and Indian Mutiny. ALS. 3pp. Midhurst (the printed letterhead '6 Hill Street, W' deleted). 15th May 1886. To [William] Woodall. Marked "Private". Together with a fine portrait photograph. "I return to office work tomorrow, so if you wish to see me about the enclosed LETTER - which is for your own perusal only - I shall be glad to pay your room a visit. The writer I knew years ago when a subaltern officer in the Crimea - I knew him when he was a subaltern in diplomacy also. He may be an enthusiast but he certainly is a very clever fellow who knows more of the science of gun making than many of those to whom we pay high salaries. I hope your Committee of enquiry will not be a purely departmental or R[oyal] Artillery affair. I think the outside public is becoming as tired of Ordnance Committees as the Army has long been." 8vo. Approx 7 x 4.5 inches. Mounting residue to verso of last leaf, very slight foxing marks, else fine. The photograph of Garnet Wolseley is a fine 19th century gelatin silver print, measuring 6 x 4 inches (excluding mount), laid down on card. 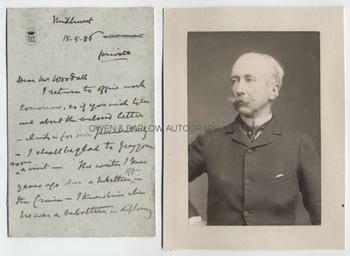 It shows a confident looking Sir Garnet Wolseley dressed in civillian clothes, half length, turning towards his right with hand on hip. 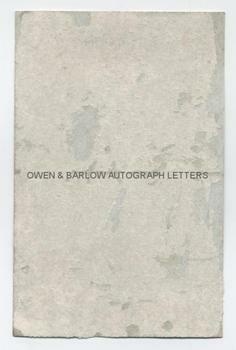 There are mounting traces to verso but image is in fine condition. Both the letter and the photograph are from a 19th century collection made by the radical Liberal M.P., William Woodall. 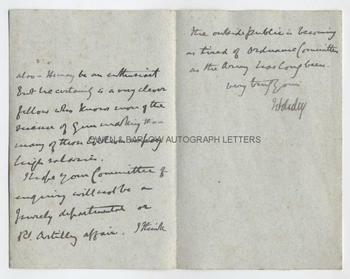 At the date of this letter, Woodall was Surveyor-General of the Ordnance under William Gladstone's government and Sir Garnet Wolseley was serving in the War Department as Adjutant-General to the Forces. 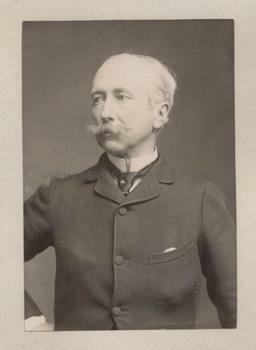 Garnet Wolseley was then at the height of his influence, having recently served with distinction in Egypt and the Sudan, where he had commanded the expedition for the relief of Gordon at Khartoum. He was very keen on army reform and on improvements in organisation and equipment and his reputation for efficiency gave rise to the saying "everything's all Sir Garnet", meaning all is in good order. He had many difficult dealings with the Ordnance Department but throughout this he seems to have remained on very good terms with Woodall, who he always trusted to "do the right thing".